In today's globally-linked world, international vendors and subcontractors provide products to clients thousands of miles away, making it difficult for foreign buyers to evaluate manufacturing processes taking place on different continents. We support you with vendor and subcontractor audits designed to prove the reliability of both potential and current suppliers. Our on-site vendor assessment services help you to ensure that your quality expectations and compliance requirements are met globally and along the entire supply chain. Take advantage of our extensive vendor audit procedures and vendor quality management services to ensure the quality of the products you intend to purchase before placing the order. Our independent inspectors examine the manufacturing processes of your potential vendors and their subcontractors throughout the supply chain. This helps to assure the quality of industrial equipment, machinery, components, materials or products you are intending to purchase. Detailed information gathered on-site at both vendors presently supplying goods and those under consideration can improve your business performance by helping you to avoid bottlenecks and weaknesses in production, which could lead to delays and increase project costs. Make your appointment now to benefit from our extensive vendor assessment services! Together with the buyer, we complete a technical questionnaire based on each supplier's profile, references, and a list of specific characteristics. After thorough planning and coordination, our auditors conduct on-site examination, audit and assessment of vendors and subcontractors. 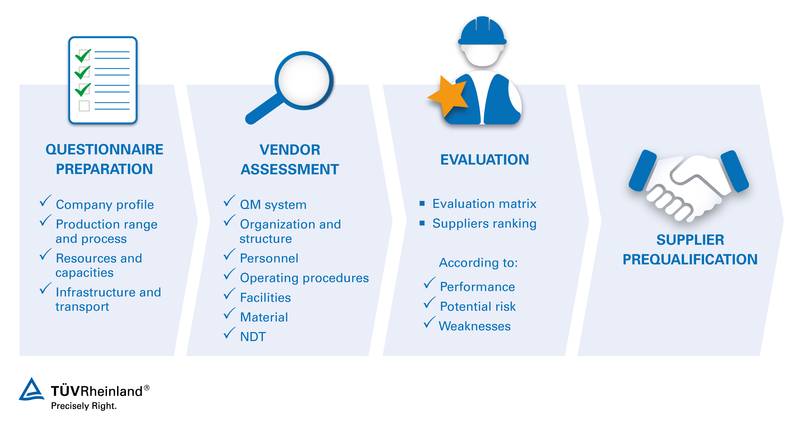 According to the results of the vendor audits, we provide a customized evaluation matrix based on a traceable and non-discriminating model in order to list suppliers according to their performance and outlining potential areas of weakness and bottlenecks. Our experts prequalify global suppliers based on the evaluation matrix, preparing a bidder's shortlist of capable suppliers prior to purchase. Additionally, it is possible to identify sub-standard suppliers and give recommendations to help them improve quality to an acceptable level. Our experts draw upon extensive experience gained from international projects in every industry and of every size to provide you with comprehensive services. To ensure you the best results possible, our vendor audit is conducted according to both client- or project-specific requirements as well as our own assessment scope. Tap into our years of experience and request more information on customized vendor assessment services today!